Catholic Monsignor William Lynn faces accusations that he failed to keep priests accused of sexual abuse away from minors. 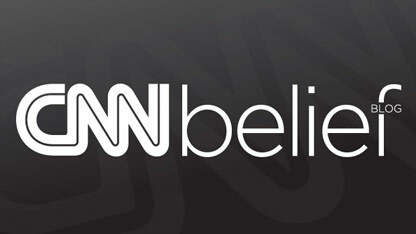 Philadelphia (CNN) - Preposterous. Disgraceful. Shameful. Absurd. Ridiculous. 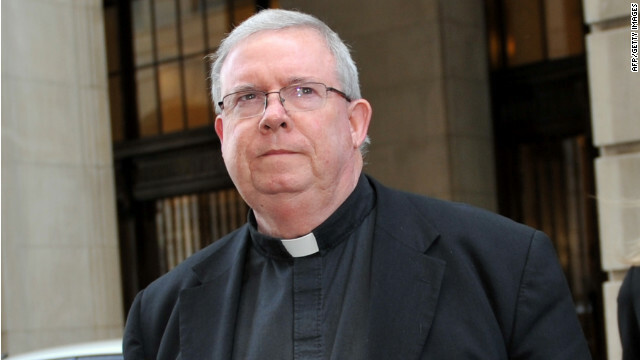 Those are words Assistant District Attorney Patrick Blessington used in court Thursday to describe the behavior of Monsignor William Lynn, the highest-ranking cleric to be charged with child endangerment in the landmark child sexual abuse and conspiracy trial in which he and another Philadelphia priest are defendants. "He actually looked you in the eye and said he put victims first. How dare he?" Blessington asked jurors during his more than two-and-a-half-hour closing argument. "The hero," Blessington yelled before turning to Lynn and pointing. "That's what you saw, our hero here, endanger kids." 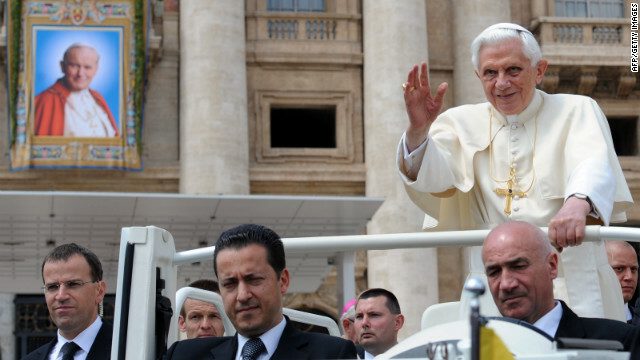 Pope Benedict XVI travels with his butler Paolo Gabriele, center, who was arrested in connection with leaked papal documents. (CNN) - Pope Benedict XVI's spokesman has denied the pontiff will resign over the arrest of his butler on suspicion of leaking confidential documents, the Vatican press office said Thursday. During a Wednesday meeting with journalists to answer questions about the situation, the Rev. Frederico Lombardi said the "hypothesis" advanced by some media outlets that the pope would resign are "baseless creations of some journalists, which have no foundation in reality." Butler Paolo Gabriele, 46, was arrested last week and accused of illegal possession of confidential documents. Lombardi said Wednesday that Gabriele has met with his attorneys, "who will probably request monitored surveillance or house arrest for their client." Gabriele, one of only a handful of people with access to the pontiff's private desk, has been charged with aggravated theft for allegedly stealing private documents, Lombardi said earlier. He is suspected of leaking the papers to an Italian journalist. (CNN) - One of the most powerful Catholic Church leaders in America approved payments of $20,000 to get abusive priests to leave the church, abuse victims and the archdiocese in question said Thursday. Victims feel "considerable dismay" that leaders of the church in Milwaukee "have been apparently engaged in paying off those who betrayed the children of our archdiocese," they said in an open letter to the current head of the church in Milwaukee, Archbishop Jerome Listecki. But the case could reverberate far beyond the borders of the Midwestern city. First it was a Christian pastor in North Carolina who told his congregation on Mother's Day that the way "to get rid of all the lesbians and queers" was to put them behind an electric fence and wait for them to die out. That video went viral, fetching more than a million views on YouTube. On Sunday, Pastor Curtis Knapp of Kansas preached that the government should kill homosexuals, in another videotaped sermon that drew lots of online attention. The charges ranged from promoting “radical feminism” to espousing religious teachings out of step with the Catholic Church. Now, six weeks after many American nuns said they were blindsided by a bruising Vatican assessment, a key nuns' leadership group is meeting to decide how to respond. The Vatican expressed rare public anger Wednesday in blasting the leaking of private papers from the pope's apartment, a scandal that observers say lifts the lid on a secret power struggle going on behind the closed doors of the Catholic Church. A top Roman Catholic Church official called the theft of the documents "an immoral act of unprecedented gravity" and "despicable abuse of the relationship of trust that exists between Benedict XVI and those who turn to him."